So what is Natoora all about? Natoora is about the finest quality groceries online: fresh food delivered straight to your door. Natoora is an online food specialist with a difference. They source the finest quality fresh food and groceries from the best markets and specialist local suppliers in the UK, France and Italy. As suppliers of some of the top restaurants in London, including such luminaries as The River Café, Theo Randall and The Greenhouse, you know you're in safe hands! Their passion and experience for fresh, seasonal foods is second to none so you can be sure that when you buy online from Natoora, you are getting unrivalled quality and expertise in every product. Why not find out for yourself by visiting www.natoora.co.uk and placing an order. "All our citrus fruits are tasting amazing at the moment (February). 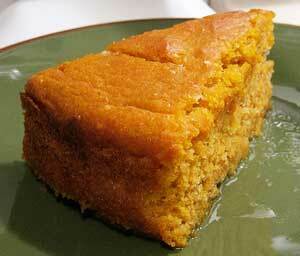 Now in peak season, our oranges are getting larger and juicier  perfect for this delicious orange cake." Separate the egg yolks from the whites, beat the yolks with the sugar until white and fluffy. Sieve the flour a little at the time, trying to avoid lumps, then finally add the melted butter and the baking powder. Now beat the egg whites until super firm, and carefully add to the mixture. Pour everything into a baking mould (buttered and dusted with flour) and cook for 30 - 35 minutes at 180°C. While cooking, you can prepare the decoration if you like. Thinly slice the remaining orange and caramelize the slices in a pan with the sugar. When the cake is ready, dust with icing sugar and decorate with the caramelised orange slices.